Universal ironing board with heating and sucting. Thermostat. Universal ironing board with heating, blowing and sucting. Thermostat. Set ( varnisched or inox body ): steam generator, iron, pressure manometer, steam control valve. Universal ironing board with heating, blowing and sucting. Inox boiler, thermostat, steam control valve. Ironing board with heating, blowing and sucting. Thermostat. Ironing board with heating, blowing and sucting. Inox boiler, thermostat, 2-steam control valve, water pump. Steam generator, boiler inox 7 l, rotor water pump, manometer, 2-3 steam control valve, fitted for supplying 2/3 irons. 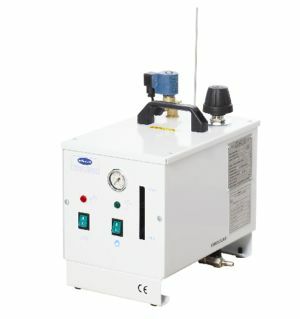 Steam generator, boiler inox 5 l, manometer, steam control valve.